This is old version Nibblers 1.15.3 apk for Android, you can install it if you want to downgrade or install old app. It is top Puzzle apps from Rovio Entertainment Ltd..
With over 200 levels to complete, Nibblers is definitely a fun casual game for everyone. As you continue the story, you will move to many different places and challenges. The fun part will increase in conjunction with the challenge you face as you move to the next levels. Cute graphic might be the best feature of Nibblers. You will play as many cute and colorful aquatic creatures to save the day. The beautiful and colorful backgrounds will accompany you as you fight against the lizards. If you want more challenge, you can always contact your friend through a social network and challenge your friend to determine the player with the highest score. The leaderboards will always be updated to determine the best player around the world. 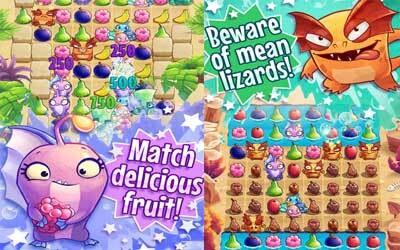 For a casual game, Nibblers for Android is a fine addition to your Android device.